A new spin on the lazy Susan, this personalized version is fashioned into the shape of a wine barrel top. 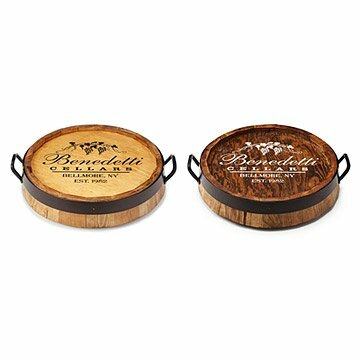 Showcase your love at family dinners and anniversary brunches with this gorgeous personalized Lazy Susan, handcrafted from an assortment of oak, pine, and ash wood into the shape of a wine barrel top. Featuring wrought iron handles for easy serving, this tabletop essential displays you and your sweetie's names, along with your anniversary and the place you call home. Handmade by coopers in Manassas, Virginia. 3.5" H x 18" diameter; 7 lbs. This is a beautiful, quality product. I was so happy with the first gift (as were the recipients) that I bought it for my sister for Christmas this year. Now I just have to figure out a way to drop enough hints to get one for myself. You CAN'T go wrong with this. This is a wedding gift for my son and future wife. I wanted to give them something as a keep sake and that suits their lifestyle and personality. They get married on January 5th 2018 but I know they will be very impressed with it. Heard the bride and groom liked the customized gift; however I haven't seen it yet. I purchased this as a Christmas gift. Naturally, when it arrived I had to open it to make sure it looked alright. I was slightly nervous, as this was a custom gift and there were no returns. I needn't have worried. This can be used as described (a lazy susan) and it's sturdy enough to hold multiple items on it, or it would be gorgeous hanging on a wall. My parents will love the customization and it will go beautifully in their home. I wish I knew whether it was made from an actual wine barrel or if it was made to look like one. Either way, it's a great product. This piece sits on the center of our kitchen table for daily use - stylish and practical/functional. Both recipients have loved this lazy susan. It is not only functional but a conversation piece. The product itself is very nice. I wasn't specific on the dimensions when buying and it is too big for my purpose. My husband loved the idea and we will repurpose it for parties, etc. This is a unique piece that I hope will be appreciated by the bride and groom. It is quite attractive, although the dark stain appears a little blotchy in places. The customized writing came out wonderfully. I think it will look great displayed on a wall or shelf. Happy that I went this route.